Kids Aboard Around the World! 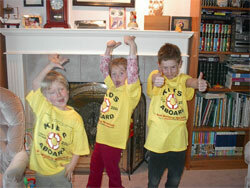 Send us your photo and we will send you a Kids Aboard t-shirt! 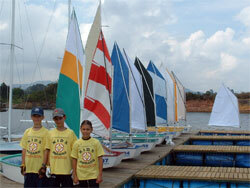 Click here to get your own Kids Aboard Flag! 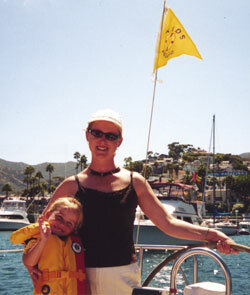 Amber Henshaw and her parents (pictured here with her mom Kimberly), moored in Avalon Harbor at Catalina Island after sailing from San Diego, CA on her family's Tartan T31. They rented a golf cart and toured around the island. (they have special seats for the little ones) She giggled the whole time and helped pick out where their boat was while looking down from the top of the mountain. There are a few beaches to hang out on. Amber's favorite beach was the one north of the casino where she danced in the sand to the music coming from the beach bar. The Henshaw's also rented a sea kayak and paddled over to Amber's favorite beach. The restaurants are kid friendly and the food is wonderful! A great place to sail to. Kimberly recommends getting there mid week if you are planning to go during the summer. The moorings fill up fast on the weekends. 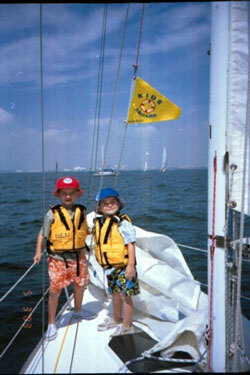 Ben & Sam Beatson with their parents aboard their J24 NOIT'SNOT in Tampa Bay, off of St. Petersburg, FL where they got their Kids Aboard flag! The Beatsons report that there are quite a few kids racing with their parents in the Friday night races. They plan on being at the SSCA Gam in Melbourne in the Fall. See you there guys! 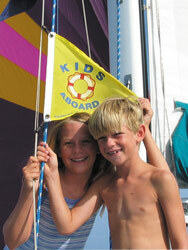 Emilie & Alec showing off their flag during their family's cruise to the Caribbean in the summer of 2003. 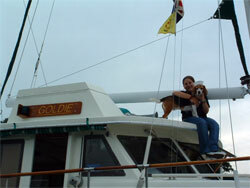 Danielle shows off her flag while cruising on her family's motorsailer "Goldie"
The Bates family in Northwestern Canada is happily wearing their t-shirts and not too shy to show it! These three sailors from Medellin, Colombia are sailing in style after getting their shirts at the Miami International Boat Show.